Posted on พฤษภาคม 1, 2015	by สช. Posted on เมษายน 29, 2015	by สช. A community meeting room in Ban Khao Mo village in Phichit, about 300km north of Bangkok, has been locked up. Plastic chairs are stacked up in rows. Dry leaves are scattered on the concrete floor. Across the street are three huge concrete water tanks, empty. Not far from them stand four houses, a temple with only one monk and an unfinished construction site. The scene is desolate, the village nearly abandoned. Suekanya Theerachatdamrong, a tiny 39-yearold woman, lives in one of those houses. She is preparing blood test results to present to the governor of Phichit. The results show high levels of manganese, mercury and arsenic. Suekanya is not alone – her family, including her only daughter, a primary school student, and other people in 12 villages in Phichit, Phetchabun and Phitsanulok provinces, have suffered and fallen ill because of the heavy metals in their blood. Suekanya’s house is located near the edge of Akara Resources’ Chatree Mining Complex, the country’s largest gold mine. “We have been sick and suffered a great deal for many years. We can’t drink our own water and eat home-grown fruits and vegetables, as water and soil are contaminated with the heavy metals,” said Suekanya, a farmer-turned-activist. The Ministry of Industry granted concessions to Akara Resources to operate the gold mine on a 78,257 rai plot of land on the border adjoining Phichit, Phetchabun and Phitsanulok provinces. The company is also exploring the nearby 9,629 rai for more gold ore. About 6,000 people live in the 12 villages nearby. “If we did not speak out, no one would ever know that the gold mine has impacted our lives,” she said. Born and raised in Moo 9 of Ban Khao Mo village, tambon Khao Chet Luk in Phichit, Suekanya was a vocational school student when Akara Mining, the former name of Akara Resources, explored the land and found gold ore in 1995. “We did not know much about mining operations. We were glad that our hometown has gold ore. The company told us that mining would bring jobs. We did not have to live far away from home, as we could work for the mine,” she said. The majority of the villagers initially supported the mining operation. Suekanya, who had been working in Bangkok, was recruited to work in the purchasing department of the mining company. During the first year of the mine’s operation, people raised concerns over noise and dust from the mine, which operated 24 hours, she recalled. Ban Khao Mo village was located only about 2km away. During the second year of operation, tap water, which originated from groundwater resources, began to have an unpleasant smell. When the water was kept in a container for seven days, purple and black sediment was clearly visible. “When we bathed with the tap water, we felt itchy. Parts of our skin was covered with rashes and blisters. The more we scratched, the more we felt itchy. The size of blisters also became larger. Some toddlers also got boils on their buttocks,” she recalled. The villagers informed related authorities and a mobile testing unit of the Groundwater Resources Department in Phitsanulok found high levels of arsenic. “The officers told us that our lives would be shortened if we kept using the contaminated tap water. But they refused to give us the official results. We didn’t know what to do, so we had to live with it,” she said. When the villagers learned that the mine would expand to its second phase in 2003, they began to protest, a campaign that lasted well into 2008. First, they submitted petitions to the Tambon Administrative Organisation (TAO) of Khao Chet Luk. Later, about 300 villagers protested in front of the TAO, demanding the chief to stop the mine’s expansion. They also sent petitions to the Phichit governor, the Natural Resources and Environmental Policy and Planning Office, the Primary Industries and Mines Department, the Natural Resources and Environmental Ministry and the Ministry of Industry. They even protested in front of the mining office. Suekanya drafted and submitted those petitions. During her campaigns, she received many threats, as the villagers were divided. She recalled that the first threat was when someone left a dog’s head in front of her house. One night two men drove a motorcycle past her home, cursed her loudly and fired a gun to intimidate her. Sometimes, her neighbours found strangers hiding behind bamboo bushes not far from her house. Once, her neighbour fired a shotgun to scare away two strangers as they were patrolling on a motorcycle at night behind her house. They exchanged fire, but no one was hurt. She was forced to sell her land or lose her job. She refused to sell and was fired in 2007. “The company offered to buy my house with this 1.3 rai plot of land for 7 million baht. It’s a large sum for this small piece of land, but I didn’t accept their offer. If I’m not here, no one will fight for us,” she said. In 2008, Suekanya submitted a petition to then industrial minister Suwit Khunkitti, urging him to reject the new concessions as the mine attempted to expand to the second development phase. “Sadly, the minister gave the green light to the mine’s expansion within three days of receiving our petition,” she said. These experiences reinforced her perception that Akara Resources was too strong for her and the villagers to fight. But she has not given up. The villagers joined the Community Networks on Social and Political Reform, a block of 480 communities and 18 groups of people nationwide who have suffered from the problems of land usage. She also led representatives of the 12 villages to mining operations in other provinces such as a potash mine in Udon Thani, a basalt mine in Ubon Ratchathani and an iron ore and gold mine in Loei. “When we joined the network, we gained more knowledge of mining operations, laws related to mining, danger of mineral compounds generated by the process of mining and the impact of the heavy metals to our health,” she said. In November 2010, Suekanya led 44 villagers of Ban Khao Mo to the Phitsanulok Administrative Court. She filed a lawsuit against five state authorities – the industrial minister, the director-general of Primary Industries and Mines Department, the Mining Committee, the director-general of the Forest Department and the mayor of Khao Chet Luk Municipality – for allegedly issuing illegal mining concessions and land-use permits to the company. The plaintiff asked the court to revoke the five mining concessions granted to the company for its second phase expansion and to withdraw permission to use forest land and public areas. Two years later, in 2012, the court issued a verdict – the company must carry out an environmental and health impact assessment (EHIA). If the EHIA was not approved by the agencies concerned within a year, the concessions would be revoked. However, the mining is still in operation today. Suekanya appealed the verdict to the Supreme Administrative Court. The case has not yet reached to its final stage. “We want to close the mine,” she said, adding that the more the mine is operated, the more lasting and powerful the toxic impact will be. Like the Mae Moh coal mine in Lampang, the mine continues to expand while people living near the mine suffer. “If the company is done with the gold mine, only toxic compounds will be left in Phichit, and it will take decades for cleaning. Like the Karen people in Klity village in Kanchanaburi, they still suffer from toxic lead for decades after the lead-processing factory was ordered to close,” she said. Last year, a team from Rangsit University collected samples of water, sediment and plants to analyse. It found high contamination levels of mercury and lead in water, and arsenic and manganese in sediment. Rice and home-grown vegetables were found to contain manganese and cyanide. Plants growing in streams contained high levels of cadmium and manganese. The university also worked with the Central Institute of Forensic Science (CIFS) to collect blood from 731 villagers living near the gold mine. They found excessive levels of arsenic and manganese in blood samples of 483 people, micronucleus irregularities in 209 people and damaged DNA, which can lead to cancer, in 91 people. CIFS chief Porntip Rojanasunan gave an interview in which she stated the villagers were at risk, and that it is important for authorities to create a proper plan to ensure they receive immediate treatment, as manganese can cause neurological problems and, with extended exposure, symptoms resembling Parkinson’s disease. Arsenic poisoning causes ailments ranging from headaches to convulsions to night blindness and strokes. After the news was reported, Akara Resources CEO Pakorn Sukhum argued that the findings may not necessarily be related to mining, and that the claims were yet to be verified by the Pollution Control Department. The results, however, prompted the Department of Primary Industries and Mines to suspend its gold extraction operations for 45 days in January. The mine has since resumed operations. Suekanya, meanwhile, urged the company to clear out all the people living close to the mine. “The findings clearly show that our blood have heavy metals that exceed safe levels. We tried eating organic food, bought drinking water from another district and applied detoxification, but the level of heavy metals are still high. We have been sick for many years. We have asked for help for many years. We have complained, petitioned and protested – the authorities and the government don’t help us,” she said. Sometimes she feels weak and scared, as she does not only have heavy metal, but damaged DNA. Her father died from cancer at the beginning of this year, but she has no plans to wave the white flag. 1993 Akara Mining, later known as Akara Resources Pcl, is established as a subsidiary of Kingsgate Consolidated, a gold mining and exploration company in Australia. 1995 Akara Mining explores Khao Pong Mountain, located between tambon Khao Chet Luk in Phichit and tambon Hua Dong in Phetchabun, and finds gold ore.
2001 The company receives a concession to operate the gold mine from the Department of Primary Industries and Mines of the Ministry of Industry. 2003 The company makes plans to expand the mine. Villagers protest against the expansion, as their tap water is contaminated and some people fall ill.
Jul 19, 2008 Suekanya submits a petition to the Ministry of Industry to reject the mine expansion. Jul 21, 2008 The minister approves the mine’s second development phase, with five concessions as requested. 2010 The Pollution Control Department sur-veys water wells around the mining site and finds high levels of heavy metals such as lead and manganese. 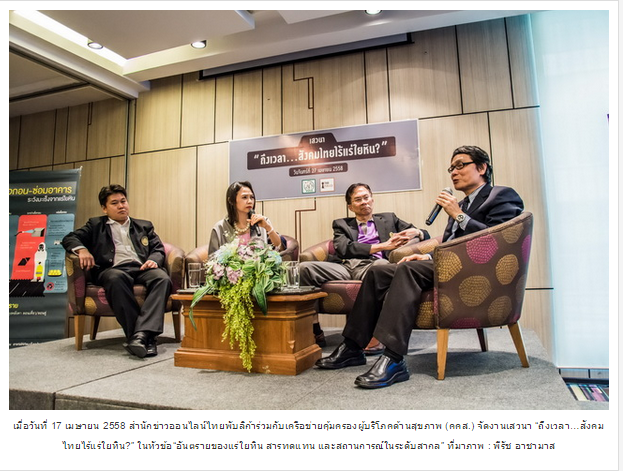 Nov 11, 2010 Suekanya files a lawsuit to Phichit Administrative Court against five state authorities for allegedly issuing illegal mining concessions and land use permits to the company. 2011 The villagers submit a letter to Abhisit Vejjajiva’s government. The Minister of the Prime Minister’s Office, Sathit Wongnongtoey, orders the TAO of Khao Chet Luk to supply clean water for villagers. However, only people living in Moo 3 and Moo 9 have so far received water. 2012 The Phitsanulok Administrative Court gives its verdict, stating that the company must carry out an environmental and health impact assessment and be approved by the agencies concerned within a year or the concessions will be revoked. May 25, 2012 Suekanya appeals the verdict to the Supreme Administrative Court. Nov 2012 Akara Resources doubles its total processing capacity from 2.3 million tonnes to 5 million tonnes per year. This amount later increases to 6.2 million tonnes per year. 2013 A group of 30 villagers in Ban Khao Mo has their blood tested and cyanide is found. Suekanya leads 300 villagers to the Australian embassy in Bangkok to submit a petition to ask the Australian government for help. Akara Resources sues her for defamation. Jul 2014 Villagers from Phichit, Phitsanulok and Phetchabun, led by Suekanya and Wanphen Promrangsan, submit a petition to the National Council for Peace and Order (NCPO) and the Central Institute of Forensic Science’s chief, Dr Porntip Rojanasunan. Nov 2014 Porntip and her team join Rangsit University, which is sent by the NCPO, to collect samples of blood and urine from 731 villagers in Phichit and Phitsanulok. Over half of the samples contain unsafe levels of manganese and arsenic. Jan 13, 2015 The Department of Primary Industries and Mines (DPIM) suspend gold mine operations for 30 days. Jan 16 Thirty villagers led by Suekanya submit a letter to the DPIM director-general Surapong Chiangthong, asking him to find solutions for the 6,000 villagers living in the three provinces. Jan 22 Representatives of the three provinces join 20 NGOs and other communities impacted by nationwide mining to issue a statement. They ask the Council of State to revise a new Minerals Act and urge the government not to submit the new act to the National Legislative Assembly, as this will make it easier for companies to search for minerals in protected areas such as national parks. Feb 12 The Ministry of Industry adds 45 days to a 30-day suspension on operations imposed against Akara Resources after the company fails to prove its gold mines do not pose a health threat. Feb 19 Forty villagers from five provinces – Phichit, Phitsanulok, Phetchabun, Saraburi and Lop Buri, led by Suekanya and Wanphen, submit a petition at a complaint centre at Government House, asking Prime Minister Prayut Chan-o-cha to order CIFS and Rangsit University to conduct health checks on 6,000 villagers and test the ground and water near the gold mine for toxic substances. Representatives from Saraburi and Lop Buri join villagers after hearing their provinces are likely to be the next locations for new gold mines. Feb 26 The gold mine resumes its operation after the ban is lifted. The company is required to hold public hearings in the affected provinces, allowing village representatives to join authorities in inspecting the mining operations, creating a better understanding with local villagers, and to treat any villager whose illness is a result of its work. Mar 30 Representatives of the three provinces meet with Phichit governor to ask him to help the sick people living near the mine. No government action has so far been taken.